Since sending the manuscript off to its day of judgement I’ve been taking time off in the garden. Plants mature daily, the delphiniums in particular. When I started in this little town garden, I could sit in the seat at the end and look back over the roofs to the medieval towers of the minster across a deep blue delphinium with soft yellow rose blossoms behind it. The rose has died and is replaced by one of a similar shade, but the delphinium blossoms each year, blooms diminished by age. I favour blooms that work their way up a stalk, and die back slowly so the stately shape and colour delight the eye for weeks. Foxgloves, hollyhocks, lupines and delphiniums fall into that category. Consequently I tend them vigorously. Those delphiniums I’ve just planted are white and pale blue, the white one doing battle with last year’s giant hollyhock which, I jest not, reached nine feet! It has started this year with four stalks, a bit strange for a hollyhock. We’ll see what happens. My short space of post manuscript freedom is not accompanied by a burst of culinary inspiration – my Achilles heel. I have no culinary imagination, and little enthusiasm. The thirty minutes I allocate for preparation and cooking of meals doesn’t allow for much imagination. A few days ago I retreated to sit in the sunshine before inspecting the poppies. Only one fat bud on each, and I reproached them. Just one! That’s a bad show, and the blooms don’t last long. 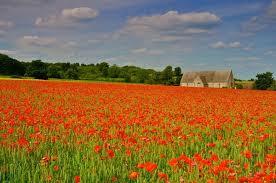 I thought of the visit we made to one of the oldest tithe barns in the country near Oxford and happened on a field of poppies as far as the eye could see – amazing. Seek, and you shall find more that you imagined. Three days later I inspected my three poppy plants, and found they all had three or four buds. Hurrah, they had listened! Now back to toil over the stove. Result, consumed in the space of a few minutes, while my garden gives me hours of uncomplaining delight. Or, to be exact, I may complain, the plants don’t. Just an occasional plea for water these sunny days. Rain forecast tomorrow. I shall be off to see a little known drawing by Michelangelo instead.